Sharma said Chicago was an ideal choice for such a study, as extreme heat has been a particular challenge for the city. During a particular brutal heat wave in the summer of 1995, more than 700 people in Chicago died due to extreme heat. Previous studies found the impact was highest among disadvantaged neighborhoods. According to the City of Chicago's website, green roof coverage accounts for an estimated 5.5 million square feet, a number that is expected to rise given the city's goal of seeing 6,000 green roofs within the city by 2020. Though green roofs have lowered temperatures and contributed to improved air quality, they are a response to hotter temperatures, not a fix. The reality of climate change shows little relief in sight when it comes to extreme heat. Temperatures are expected to rise, with comparable heat waves expected to occur at the rate of twice a decade, according to current models, rising to five times per decade in high-emission scenarios. Sharma and his team simulated temperature data and used publicly available electricity consumption for the entire Chicago region. They then calculated a social vulnerability assessment, collecting variable data from the Centers for Disease Control and the American Community Survey at the census tract. The results became the Heat Variability Index (HVI). The combination of these factors allowed researchers to take a closer look at optimal locations for green roof implementation. 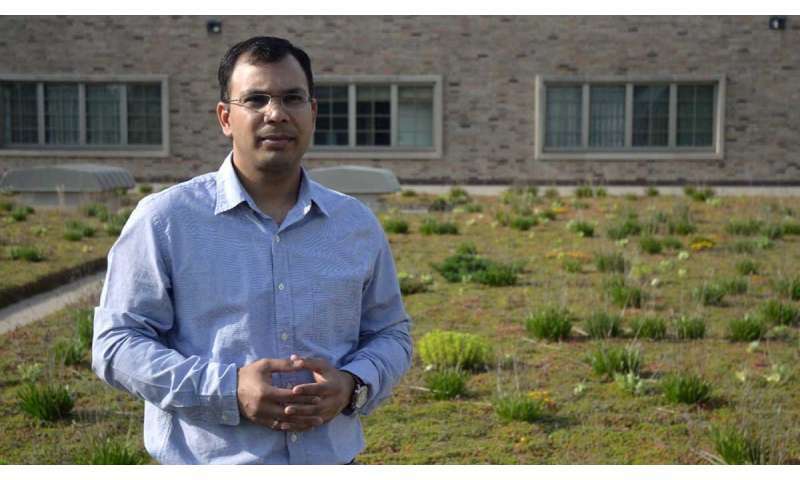 "It's critical not only to identify where green roofs can lower the temperatures most, but also to identify populations that are disproportionately affected by high temperatures," Sharma wrote in the study. Looking only at electrical consumption, those areas where air conditioning is used most, for example, may not account for affluence. In certain neighborhoods, residents can afford the cost, which ultimately makes them less vulnerable. In lower-income neighborhoods, some residents can't afford to turn their air conditioning on, or don't have access to air conditioning at all. By layering data, the result of the study is a comprehensive look at the utility of green roofs to reduce temperatures, ease electricity consumption and help the populations most vulnerable to heat exposure. "What we've seen when it comes to urban planning is decisions are made without interdisciplinary input," Sharma said. "Now, we have a framework for answering the question, how do we improve urban resilience to extreme heat?" The next step, Sharma said, is to enhance the framework to account for multiple variations, such as variables that take place throughout the day or season so models can be tailored to other cities and their unique conditions.